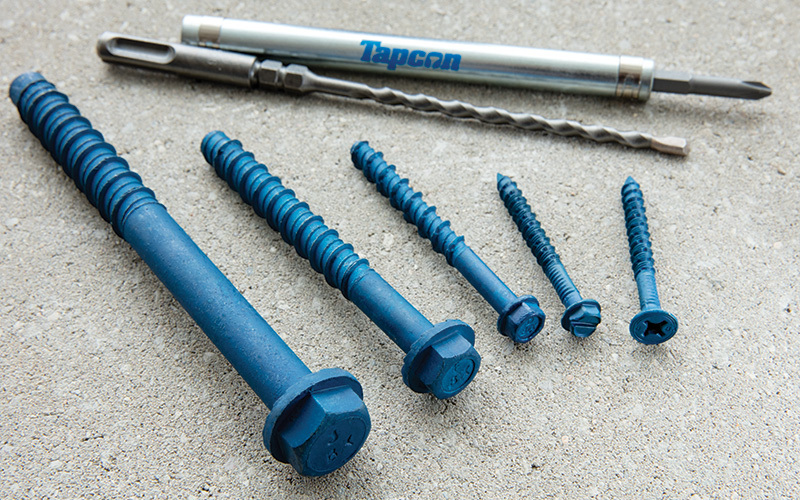 When you find it difficult to insert fasteners directly into a concrete wall or other hard surface, you may need to insert anchors before securing the screws. This guide will teach you the best types of concrete anchors to use for your next home improvement project. Tip: You will need to drill a pilot hole regardless of which types of concrete anchors you select. Be sure to have plenty of extra bits on hand and use a can of compressed air or a blower to clean dust away from the drilled hole. Always wear safety goggles and a dust mask when drilling. Click here to shop all anchors. Anchors can hold as much weight as the wall they’re attached to can bear. The shear load describes the amount of downward force gravity and the weight an object exerts on the anchor. Tensile load is the amount of force required to pull the anchor straight out of the hole. Static loads are created by objects that never move and constantly exert the same force. Dynamic loads are created by objects that move or vibrate. Impact loads are created when weight is increased suddenly. Concrete anchors types vary, including concrete screws, hammer-in anchors, lag shields, lead screw anchors, plastic wall plugs, anchor bolts and more. Concrete screws Best for attaching furring strips, doors and electrical boxes in concrete, brick or blocks. Feature alternating high and low threads with diamond-cut notches for extra holding power. May be sealed to provide protection against corrosion. Hammer-In anchors Best for hanging furring strips and metal brackets in concrete, concrete block, mortar and brick. Easy to install. Must be hammered into place. Avoid using in crumbly surfaces. Don't require a separate screw. Lag shields Best for use in hard masonry while shorter shields are better for softer materials. Used in conjunction with lag bolts. Short shields work well on shallow surfaces. Long shields provide greater strength. 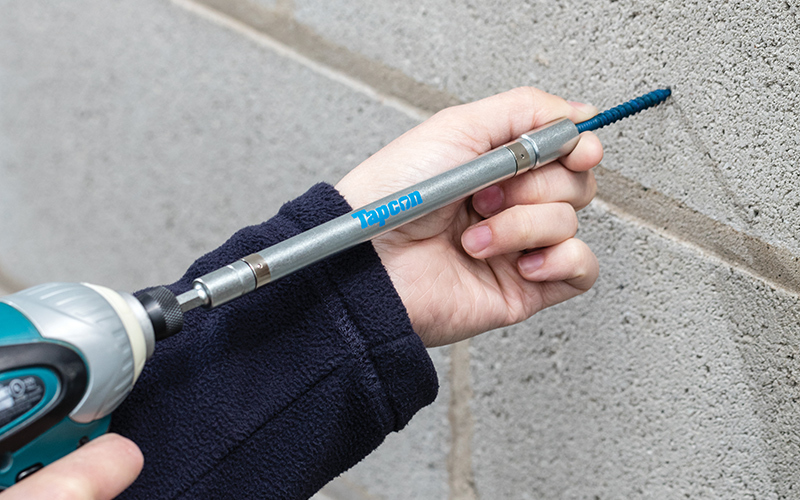 Lead screw anchors Best for securing light to medium loads in brick, concrete block and masonry. Plastic wall plugs Best for light-duty applications in masonry such as towel bars, tool brackets and shower doors. Require a pilot hole. Expand once inserted to prevent turning and pullout. Tapered ribs prevent twisting. Sleeve anchors Best for medium-duty applications in concrete block. Length is measured from the washer to the end of the anchor. Sleeves pinch the side of the pilot hole and get tighter as the screw is driven into place. Toggle bolts Best for light to medium loads in hollow block. Feature a set of wings that spring open once bolt has been placed in the hole and the screw has been tightened Wings provide a brace against the backside of the wall for a secure hold. Wedge anchors Best for heavy-duty load applications in concrete blocks and thin-wall or solid concrete. Length is measured from end to end. Stainless-steel expansion clip offers resistance to corrosion. Extremely strong. Once inserted, nearly impossible to remove. Use chemical and powder-actuated anchors when working with an extremely heavy object that requires an industrial-strength hold. These anchors are strengthened with chemicals – you will need special instructions on how to use them. Use a hammer drill when installing anchors into hard surfaces such as stone, concrete and brick. Check out our selection of concrete anchors, masonry anchors and lead anchors to find the right type for your project.